High Point, NC – (February 27, 2018) - Seventy manufacturers, suppliers and designers will debut their latest product introductions in InterHall during April High Point Market, displaying a variety of innovative new product lines, varying price points and unique design aesthetics. 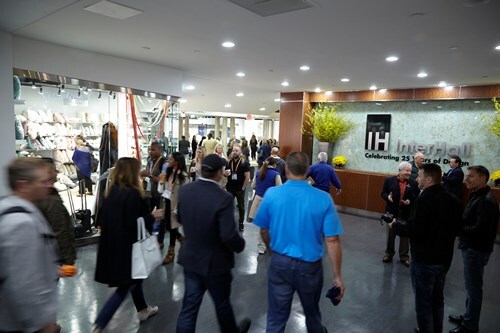 A signature High Point Market design destination that encompasses 80,000 square feet of show space, InterHall features a curated assortment of up-and-coming furniture and home décor exhibitors chosen during a juried selection process. InterHall opens on Friday, April 13. For spring market, 13 new exhibitors to InterHall include: Abigails (IH607); Consort (IH202); Couture Jardin (IH407); Honour Collective (IH106); John Strauss Furniture Design (IH410); Koket (IH112); Sobro (IH200); Temahome (IH506); Tempaper (IH502); Union Home (IH503); Vita Copenhagen (IH401); Wendy Jane by Gabby (IH201); and Michael Dawkins Home (IH404). Abigails brings tabletop and decorative accessories from Europe and Asia to InterHall, including ceramics, glass, crystal, pewter, wood, brass and terracotta products handcrafted, hand-painted and hand-finished by master artisans. Couture Jardin, founded by Normand Couture ASFD and led by his son, Phillipe, offers contemporary outdoor furniture designs includes sofas, chairs, ottomans, dining chairs, tables, barstools and loungers. The Wendy Jane by Gabby pillow line was founded by Wynne White Martin, daughter of Summer Classics founder Bew White, and features outdoor pillows with “the feel and fabrics of indoors,” according to company officials. Debuting at High Point Market for the first time, Wendy Jane by Gabby pillows are made in the U.S. with a down-feel insert and water-repellent covers and come in a variety of sizes, from lumbar to bolster to several square options. John Strauss Furniture Design showcases a full lifestyle line of furniture including upholstery, case goods, lighting and accessories. Styles include casual and resort, contemporary, modern, painted, retro, transitional, western and Mid-Century. Honour Collective is coming to High Point Market for the first time and showcasing an exclusive home décor and wearable products lines crafted from luxury textiles, unique mineral specimens and objet d’art. Products include: luxe, weighted drapes; oversized throw pillows, a rock collection and a line of natural candles. VITA Copenhagen is introducing its furniture line at Spring Market, bringing the Danish brand’s signature Scandinavian-inspired line of home furnishings to buyers and designers for the first time. Described as “designs for urban living,” VITA Copenhagen’s style aesthetic features clean lines, strong graphical elements and clever packaging solutions to minimize environmental impact. KOKET is offering “dramatic case goods, luscious upholstery and a seasonal product look book,” according to officials. Additional products include lighting and soft goods highlighting minerals, metallic, vibrant jewel tones and even peacock feathers. Temahome is a Portuguese furniture brand founded more than 30 years ago on the principles of modern design. The company’s whole-home product line features upholstery and case goods, all designed with a focus of bringing the Portuguese aesthetic to global customers. Sobro launched in March 2017 on Indiegogo with the help of 2,000 backers who pledged $1.5 million to bring the Sobro Table to market and is coming to High Point for the first time at Spring Market. Described as “an all-in-one center that connects your powered-up life,” the Sobro Table “reflects the future of furniture,” according to company representatives. Tempaper is a designer darling, featuring removable wallpaper in a variety of patterns. For Market, the company is introducing new special order panoramic murals and a collaboration with The Novogratz. Consort, a furniture line launched by Mat Sanders and Brandon Quattrone, founders of a successful interior design firm, is a 44-piece collection of upholstery, tables and case goods inspired by the duo’s love of Parisian markets. Described by Sanders and Quattrone as meeting the need for “cool, unfussy furniture,” Consort showcases the founders’ “elevated aesthetic,” one that has attracted numerous A-list clients from the east and west coast. In addition to the new exhibitors, notable returning exhibitors include Adriana Hoyos Furnishings, Badgley Mischka Home, Bungalow 5, Eichholtz, Imagine Home, Nathan Anthony Furniture, Nuevo, Selamat Designs and Sunbrella. Also notable for Spring 2018, Worlds Away and Emdee are each celebrating their 25th Anniversary. InterHall’s distinctive product lines and designer-friendly resources will be on display during spring market from April 13 – 18 in IHFC, Commerce Wing, Hamilton Wing and Design Center on the first floor. International Market Centers, L.P. (IMC) is the world’s largest operator of premier showroom space for the furnishings, home décor and gift industries. IMC owns and operates 12.2 million square feet of world-class exhibition space in High Point, N.C. and Las Vegas, including the 14 primary buildings at the High Point Market. IMC’s High Point properties Market Square, Market Square Tower and Suites at Market Square are home to Showtime, the Semi-Annual Fabric Market, which is produced by and for the members of the International Textile Alliance (ITA). For more information on IMC, visit http://imcenters.com/.